It's the most amazing machine in the universe-the human body! Discover your body, system by system and layer by layer, in this fascinating new book in the Look Inside series. Look Inside: The Human Body takes kids on an incredible journey through the powerful muscular system, the "bone zone," the long and windy road of the digestive system, the blood-pumping circulatory system, the 47-mile long nervous system and beyond! 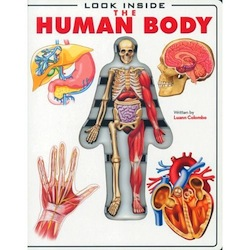 A unique layered model of the human body serves as the center point of each section, revealing key body parts and functions, while entertaining, informative text explains how the body works. Each section is fully illustrated with colorful diagrams and includes fun, interactive lessons for kids to try themselves. Kids can learn how to take their own pulse, how to make their arms float, and what different colors of urine mean - a very popular demonstration, indeed!